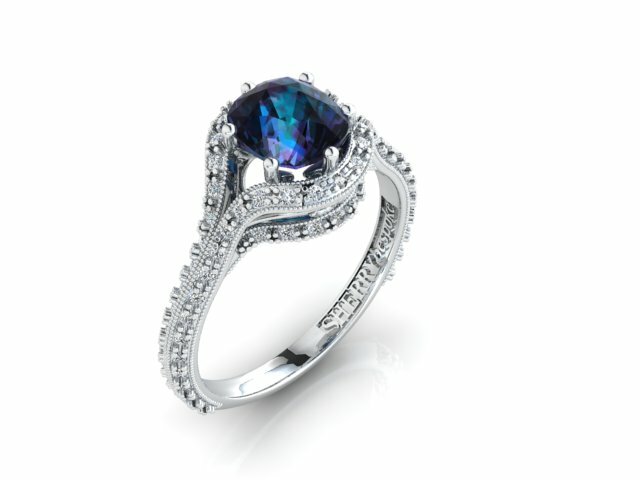 Alexandrite ring, designed and made with a ribbon of diamonds that track around and beneath this high setting. A bespoke ring from the Sherry jewellery studios, this setting holds the rare alexandrite gem, in an open setting, to allow as much light to get to it as possible. Alexandrite is a very rare (and very expensive) variety of the gem family, known as chrysoberyl. Very few people have probably ever seen a REAL, natural alexandrite. Alexandrites are well-known for displaying one of the most remarkable colour changes in nature. The very best examples are “Emerald by day, ruby by night:” These gems are hugely rare and carry a price tag to match. The most desired and well-cut stones are green in sunlight and red in incandescent light, but others have blues within the colour change. Size is always a significant factor in value. The largest known faceted alexandrite is a red/green colour change example, weighing in at 65.7 carats. This gem was mined in Sri Lanka and is now at the Smithsonian Institution. The largest Russian gems are about 30 carats. However, the vast majority of alexandrites are under one carat. Alexandrite requires both beryllium (Be), one of the rarest elements on Earth, and chromium (Cr) in its formation. (These are also required for emerald creation). However, these elements rarely occur in the same rocks or in geological conditions where they interact. In addition to this, the original source of alexandrites was almost exhausted after only a few decades of mining. 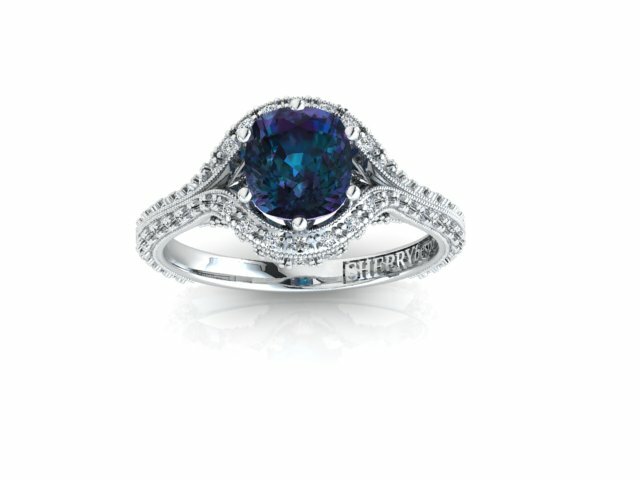 More sources of alexandrite have been found since the late 20th century.